For people who are so busy they simply do not have the time to wash their cars. Excalibur has taken the car washing service to a new level of service never offered before! The service includes coming out to the client’s house or place of work at an agreed upon day and time of the week to wash the vehicle with a full vacuum and wipe down of the whole car which includes tire treatment. 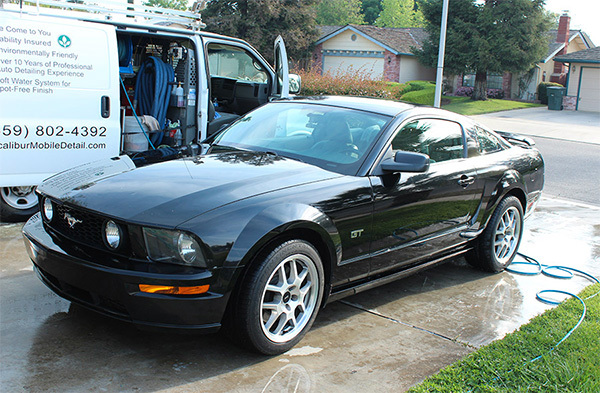 Our method of washing a vehicle is more than just the standard wash.
It’s actually a mini detail. More than likely the client will never need a full detail with this service. Most of our clients have been on the program for 5 years and still to this day, their cars look brand new inside and out. Plus we never use your tap water to wash your car saving you money! Instead we carry our own purified reverse osmosis water for washing that has been stripped of all minerals for a spot free rinse even under the hot sun. Excalibur offers a once a month billing on its service with a car wash scheduled either on a once a week or every two week basis. The invoice is sent to the client via email on the 1st of the month and can either be paid online with a credit card or by E-check in the privacy of one’s own home or office. This eliminates worries about paying after each wash. The invoice reflects the days that the vehicle was washed and any credits applied to the account for the PRIOR month for all services performed. If for any reason a wash appointment cannot be kept, such as a rainy day, Excalibur Mobile Detail will credit the customer’s account for the wash. Also as long as the customer gives Excalibur prior notice that the vehicle will not be available for the agreed upon day or time, Excalibur again will credit the customer’s account. Concierge Touchless Wash service to your home or office. We carry our own water purified by Reverse Osmosis. Allows you to pay online in the privacy of your home or office. Service available once a week or once every two weeks. Washes only! Includes once a month billing. Call Now to get a quote for the service that is right for you.